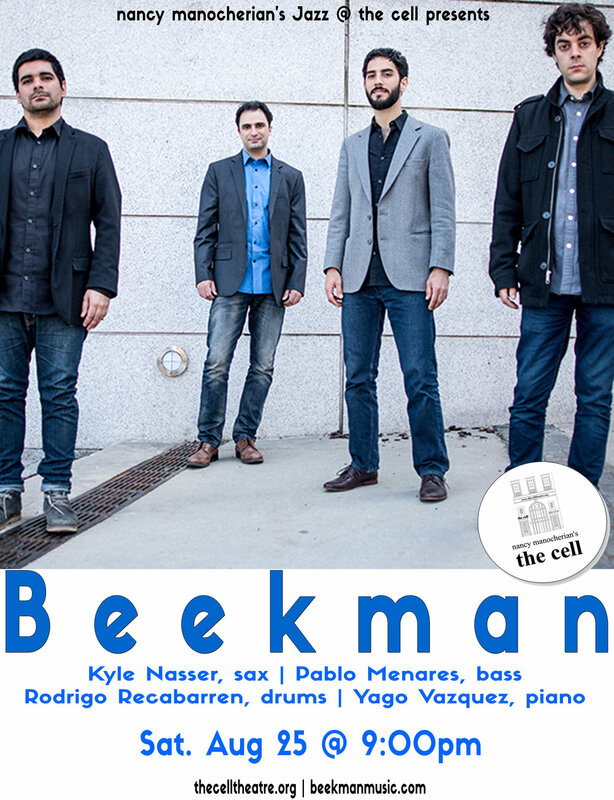 Beekman is a Brooklyn-based collective comprising pianist Yago Vazquez (Spain), saxophonist Kyle Nasser (U.S), bassist Pablo Menares (Chile), and drummer Rodrigo Recabarren (Chile). These musicians met in 2012 at the 5th Estate sessions in Brooklyn and formed Beekman shortly thereafter. The quartet couples eclectic original compositions (steeped in jazz, rock, latin, and classical) with dynamic group interplay into a sound that isinternational while remaining squarely in the realm of modern jazz. Beekman brings a plethora of influences tobear on its compositional and improvisational aesthetics, lending a unique sound. Beekman's debut (Vol. 01, Discos Pendiente 2015) earned the band a Chilean Music Award (Premios Pulsar) nomination for best jazz album.Vol. 02 was released on Ropeadope records in October 2016 to significant critical acclaim. The band has touredthe U.S. and South America extensively in support, with new tours planned for Vol. 03's release. On their West-Coast tour in the spring of 2017, Beekman hit Chez Hanny in San Francisco, a longstanding Sunday jazz salon curated by Frank Hanny. The sunny SF afternoon, a bunch of old (and new) freinds in the audience, a beautiful piano, and some killer pre-gig Mexican food combined to facilitate two sets truly representative of the way Beekman sounds live-in-concert. Fortunately, engineer Adrian Wong captured the proceedings, which Beekman is proud to present as Vol. 03 - Live in San Francisco on Ropeadope Records.